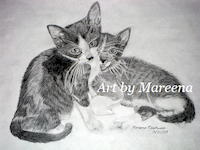 Adorable kittens named “Smokey” and “Bandit” black and white pencil drawn love scene by young artist. These gray and white kittens seemed to pose for their picture in loving delight as if they knew they were about to adorn their master’s canvas. The kitty with its full face shown is Bandit and Smokey is the one that seems to peek around the corner of his brother’s chest. Mareena created this black and white cat drawing in July of 2009.